I visited Hannna‘s house for Raya, and guess what I collected! 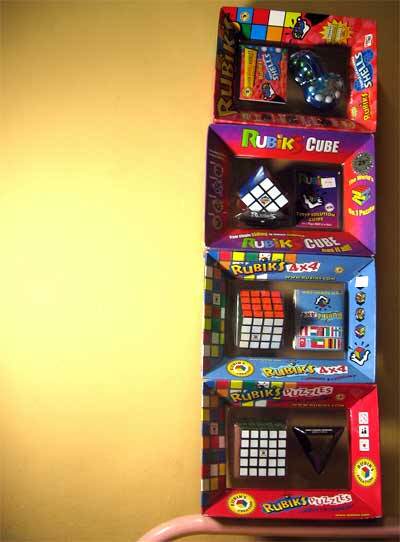 (Okay, so I had the 5x5x5 Professor’s Cube from before…) These were from Hamley’s London. Impossible to get in Malaysia, Singapore even. The original is nowhere near anything I expected. Smooth, orgasmic over-spinning, not-locking cubing. This entry was posted in Geek, Pictures, Toys on November 5, 2005 by 2konbla. I remember very clearly you dazzling us with your rubik’s cube abilities. (recall one fine day when we followed the flow in mid valley). Until today, i still tell my new friends about you and your super powers. I dunno what to say…just Oh Noes !!!!! ever took a mensa test? o.. think u find this not challenging at all while i already gave up the 3x3x3. U’re an impressive genius! 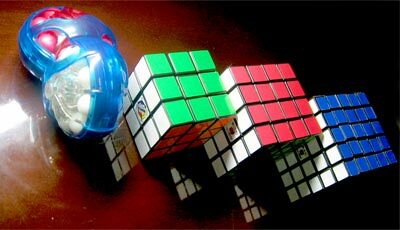 Any idea if you know where I can buy Rubik’s Revenge in Malaysia?! emily: Yes. 😀 I am a member. Angela: I’ve commented in your blog.